Fantastic Beasts is such an incredible story. If you read the books or watched the films, it’s easy to get captivated. To celebrate the release of the new film, Fantastic Beasts: The Crimes of Grindelwald, I thought what better way than to make cookies? 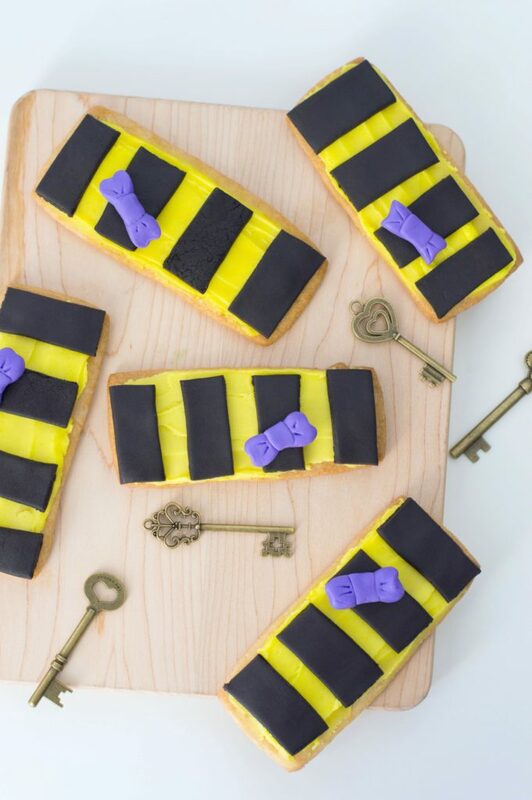 These super cute Fantastic Beasts Newt’s Hufflepuff Scarf Cookies are sure to be a hit with the Harry Potter and Fantastic Beasts lovers alike! J.K. Rowling confirmed that Newt indeed wears a Hufflepuff scarf. So, this is a nod to all those in the Hufflepuff house. The bowtie is an homage to Newt himself. Myself, I am a Gryffindor but, do have Hufflepuffs in my life. I hope you enjoy these! 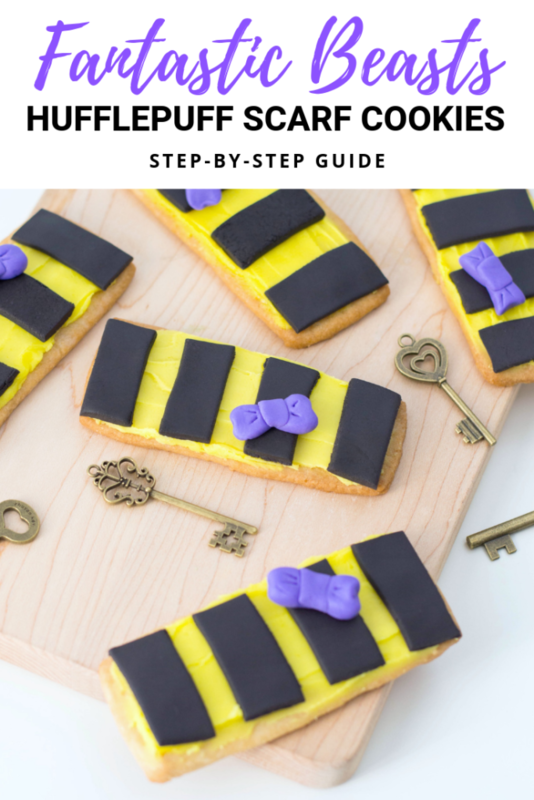 Read on for the full step-by-step recipe for these Fantastic Beasts Newt’s Hufflepuff Scarf Cookies! Prepare cookie dough according to recipe’s directions and roll it out to be ¼ of an inch thick. Using a paring knife, cut cookies into rectangles: about 3 in. x 1.5 in. in size. Bake according to directions and allow to cool before decorating. If any cookie dough remains, refrigerate in plastic wrap for future use! 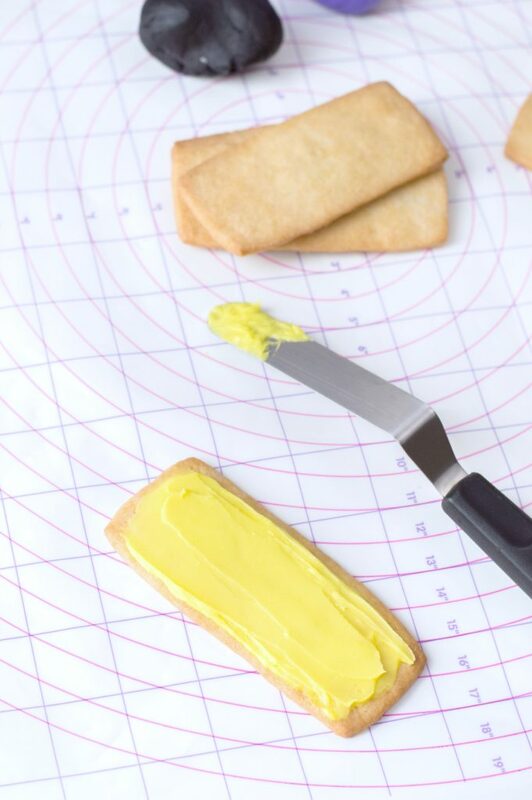 Using an offset spatula, spread yellow icing on each cookie. 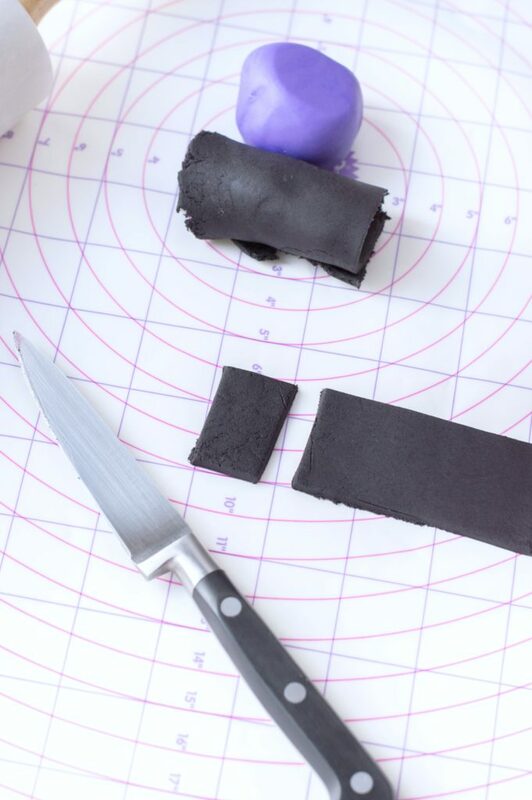 Roll out black fondant so that it’s about ¼ of an inch thick. Cut them into small rectangles, about ½ in. x 1.5 in. in size. 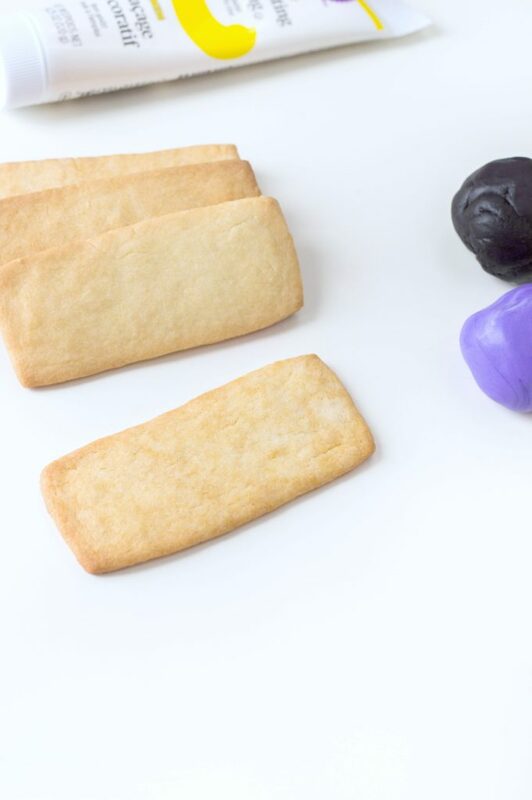 Place 4 rectangles on each cookie, leaving spaces in-between each one. 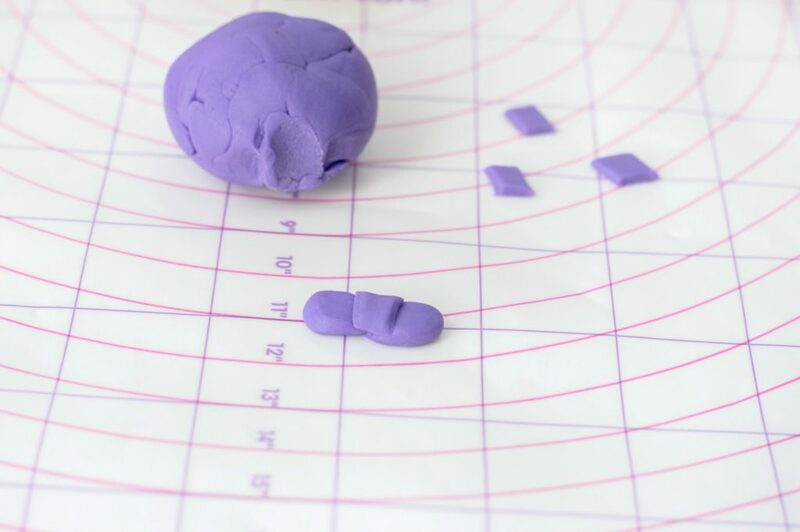 Roll your purple fondant into 24 small spheres, about ¼ of an inch in size. Flatten each sphere and pinch one end so that it resembles a teardrop. Stick two tear-drop fondant pieces together, in the middle (they should mirror each other). 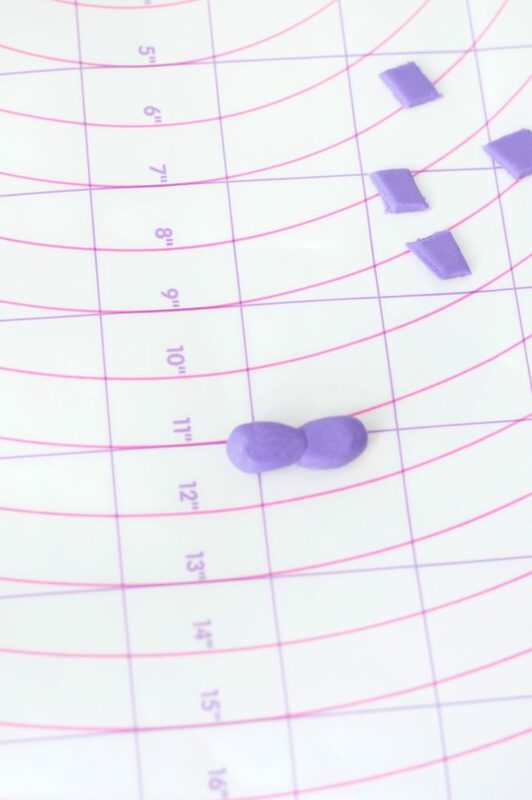 Cut out 12 pieces of purple fondant into small squares. Place in the center of each double teardrop. Press and shape until it resembles a bowtie. Use a paring knife to make little indents on the bowtie and place one bowtie on each cookie. 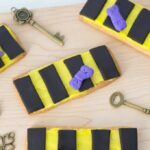 If you love Fantastic Beasts, Newt Scamander, and you happen to love Hufflepuffs too--this cookie is for you! J.K. Rowling did, in fact, confirm that Newt's scarf is Hufflepuff, that's why the addition of the purple bowtie is for him! Prepare cookie dough according to recipe’s directions and roll it out to be ¼ of an inch thick. Using a paring knife, cut cookies into rectangles: about 3 in. x 1.5 in. in size. Bake according to directions and allow to cool before decorating. 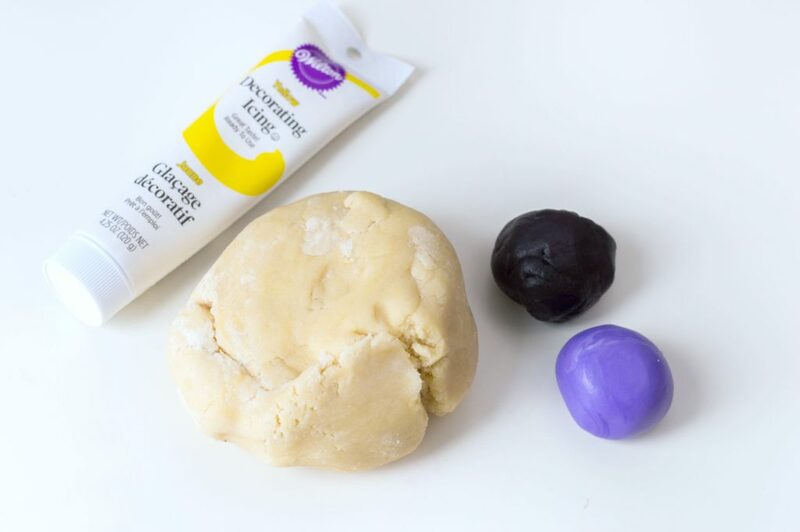 Roll your purple fondant into 24 small spheres, about ¼ of an inch in size. Flatten each sphere and pinch one end so that it resembles a teardrop. Stick two tear-drop fondant pieces together, in the middle (they should mirror each other). Cut out 12 pieces of purple fondant into small squares. Place in the center of each double tear drop. Press and shape until it resembles a bowtie. Use a paring knife to make little indents on the bowtie and place one bowtie on each cookie. Enjoy My Fellow Wizards & No-Maj’s! I hope you’ve enjoyed this fun and easy recipe. 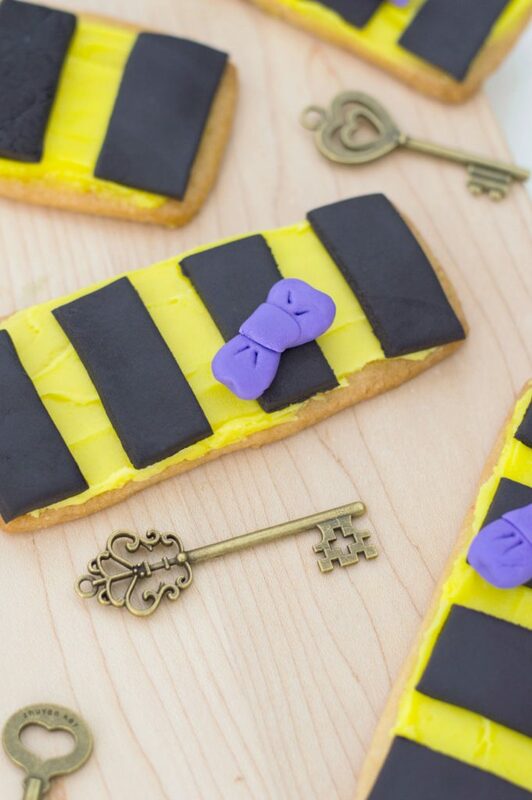 You can really turn your favourite sugar cookie recipe into something truly magical! Me? I’ve been totally enthralled with the Harry Potter universe and when Fantastic Beasts came along, it made the enchantment even greater. 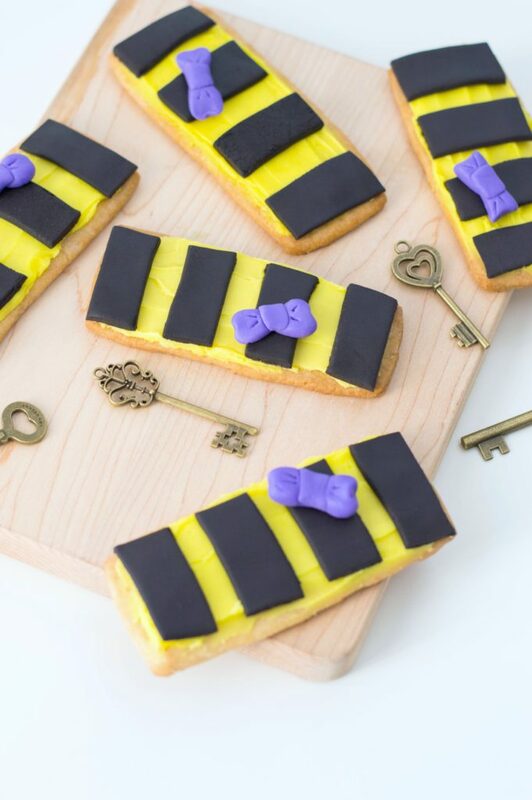 Also, I hope these make my Hufflepuff wizards and witches very happy too! If you liked this, check out our other recipes to get even more inspo! Are you a Fantastic Beasts fan? What fun and adorable cookies. Seems like they are pretty easy to make. Only hard part for me would be the bow but I think I could manage. Very simple, I am sure after the first you would be a pro. These are the cutest cookies ever! My grandkids would love making these and eating them too of course. Looks so yummy! These look awesome Nancy. My kids love Harry Potter and Fantastic Beasts. Just watched Fantastic Beasts and where to find them again this weekend! Such a fun movie and book too. These look delicious too. I think I already pinned these but will double check because it would be fun to make them. Aww, thanks for sharing Paula. So glad you liked them! You did such an amazing job on those! This makes me want to up my baking game. They’re so authentic to the house! Awesome, so happy you like! Omg these are adorable! I’m a huge fan of Harry Potter and this saga so I can’t wait to make these ha! Those are the best cookies I’ve seen all day! I almost want to say they are too cute to eat, but cuteness has never stopped me from eating a cookie before lol. These look SO good. I haven’t even seen this movie yet, but I’m all about cookies 🙂 I always like having some in the house. Yessss, always a good thing. Wow, these are awesome! Perfect for any Potter fan. I’m Slytherin but love that I could easily alter this idea to suit my house. These cookies look like a lot of fun to make. Thanks for providing a step-by-step guide. I would love to give these a try. My pleasure, hope you like them! While I’m not familiar with Fantastic Beasts, these look super creative. Will pass along to my daughter who I’m sure would want to bake them. Awesome, thanks for sharing them! My kiddo would love this. With Harry Potter being still so popular this would be a fun thing to do with them. Yes, they would totally love it! These turned out so cute! My daughter has always been a big fan of Harry Potter. These are the cutest! I’m printing this recipe out for my oldest. She would love to make them. Awesome! Hope she likes them. Those are cute! I haven’t seen Fantastic Beasts: The Crimes of Grindelwald yet, but I hope to be able to see it soon. Aren’t these the cutest? I adore the little purple bow. 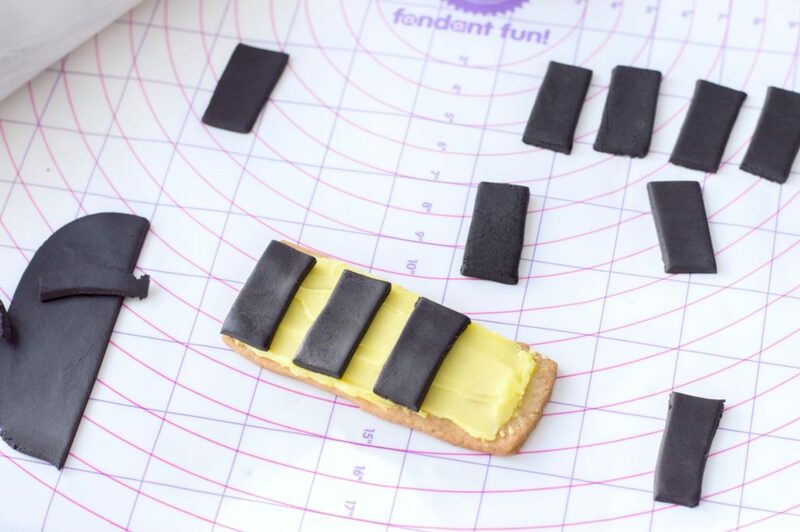 They look pretty easy to make, thanks to your tutorial! Yes, so simple! Hope you enjoy them. 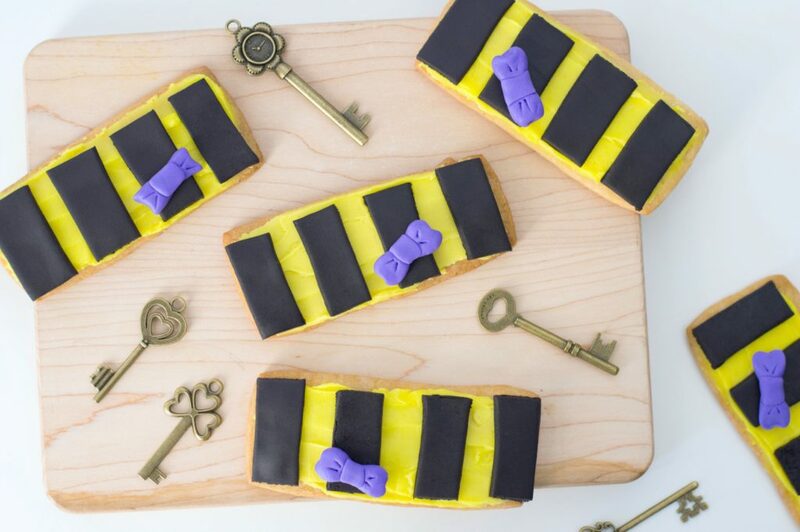 I am HP obsessed and these cookies look so cute! I need to make these for myself! How cute this is! This is perfect for Harry Potter fans! I don’t have the knack for these things though. I always wanted to try a recipe and use fondant. This may be the perfect way to break myself in.